1. Foreign Secretary, Shri Vijay Gokhale is paying an official visit to Nepal from 28-29 March 2019. 2. 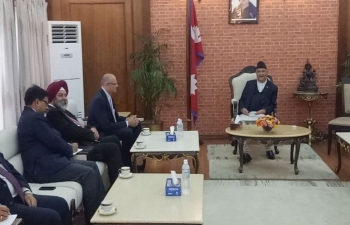 Foreign Secretary met Mr. Shanker Das Bairagi, Foreign Secretary of Nepal on 28 March 2019. He called on Prime Minister of Nepal, Rt. Hon’ble Mr. K.P. Sharma Oli and Foreign Minister of Nepal, H.E. Mr. Pradeep Kumar Gyawali. 3. The two Foreign Secretaries reviewed all aspects of wide ranging bilateral partnership and exchanged views on regional and other issues of mutual interest. They expressed satisfaction at the substantial progress that has been achieved on bilateral projects and initiatives that were discussed and agreed to during the reciprocal visits of Prime Ministers of Nepal and India in April and May 2018. The two Foreign Secretaries agreed to maintain the momentum in bilateral engagement across diverse sectors of cooperation and to further strengthen the traditionally close, friendly and multifaceted partnership between the two countries. 4. The visit of Foreign Secretary is in keeping with the tradition of regular high level exchanges between the two countries.